Your quest for help and guidance with designing new custom house plans has lead you to a good place. You have ideas about a new custom home that you have been planning in your mind for maybe years. Chances are you have scoured the internet looking through the myriad of house plan sites finding hundreds of beautiful house exteriors and floor plans. You have discovered and been amazed and inspired and stimulated by the millions of rich home design photos on sites like Houzz and Pinterest. Finally your searching includes a query for a home designer/draftsman to help you turn the ideas in your head and all the notes and sketches and bookmarked webpages into a complete set of custom house plans that can be permitted, bid and built in the real world right where you live or will be soon. That is why you are reading these words that I wrote with you in mind. I know where you have been and I know where you want to wind up and I know how to get you there while having a pleasant and productive experience during this relatively brief phase of your journey to a new custom home. When I began drafting custom house plans it was all by hand and much slower and tedious but I enjoyed it so much that I would get lost in it for hours. Then I learned an amazing software program called Sketchup that I use to build a 3D model first and then custom house plans from that. It allows us to walk or fly around the outside of the design and then take the roof off and get a good feel for the layout of each room. Everyone has enjoyed and appreciated this aspect of the house design process just as much as I always have. Another technological wonder that my nontechnological brain has begrudgingly learned is the ability to put exactly what I am looking at on my screen onto your screen. While I know there are more sophisticated ways, I have found it perfectly suffice to make a video of my screen as I present the Sketchup model and discuss different issues and ask the necessary questions, making everything very clear and easy to envision. I record my screencast, upload it to Youtube and email my collaborators an unlisted link. Then we discuss the issues I bring up again using new technology hardly used or not yet invented 15 years ago. Now there is the email, a non invasive and accurate avenue of constant contact that serves as a legal recording of all exchanged messages. I even embrace the convenience texting has brought to the process of developing a set of house plans. Just about the only thing that I don’t do is Twitter. Meeting at least once is always a pleasure and beneficial, but no longer a must. Many times I have worked with couples to design and draft their unique custom house plans having never met them in person without any problems. Once I was working with a client who spent six weeks at a time flying commercial aircraft in Angola, Africa. It was hard for my mind to grasp that we were able to text, talk and email back and forth with 8,826 miles between us as though we were neighbors. Irregardless of our locations we were able to collaborate thanks to technology and create blueprints for the wonderful custom home he and his wife are now completing in Airway Heights. I met with the Vietenhiemers at the start and the end during the whole process of developing the custom house plans. This was a completely unique floorplan that they had not seen anywhere but that fit their lifestyle like a glove. Sometimes it takes us awhile to stitch everything together, but we always get there. This video was number 5 out of 10. Sketchup is a powerful program that allows me to put the model right where it will eventually be located on Google earth. One major advantage of the program is that there is a powerful free version that I encourage my clients to download. 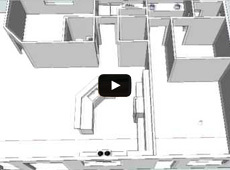 Millions of people master the program and model on it just for fun.This video is an example of the just one feature the amazing Sketchup has to offer. Sketchup and my framing experience allow me to build out a plan on my computer. On complex roofs I built them truss by truss and stick by stick to make sure they will work as planned in the real world. The video features two recent examples. 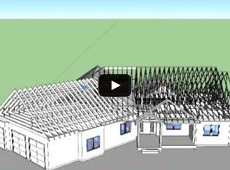 Finally, here is a video of an architect who demonstrates the amazing things you can accomplish with Sketchup for producing custom house plans. I encourage everyone to investigate what Sketchup is all about. Many of my clients have downloaded the powerful free version and then were able to open and play around with the 3d model I gave them of their new home.